Discovering some hidden gems around Miami where Voli can be found was an eye opener and a pleasure to find some of the ‘out of the norm’ places that Voli can be enjoyed off the usual track for a tourist. First and foremost I want to thank the whole Voli Vodka team and especially the incredible Voli Girl for taking me to some of the amazing places around Miami and for the great company and time I will always remember! Here’s some of the unmissable places to visit to enjoy Voli with a whole new experience every single time from one extreme to another. Be sure to have these places on your lists to visit next time you’re in Miami for the coolest VOcktails and VOLixes! First stop is The Drunken Dragon Restaurant. Known as the first Korean/barbecue restaurant on South Beach, walking by you would be easily forgiven for wondering if you had the correct address. The exterior of this little treasure has blacked out tinted windows with a big red sign as simply ‘Market’. Which leaves you a little baffled until you realise it’s actually the name of a Latin supermarket that used to be there before. However, once you open the door to this this gastro-pub/ cocktail place you’re greeted by a welcoming, dimmed and Asian inspired wooden themed ambience. Dine at the table or bar. The restaurant has a very impressive menu with a special vegan menu range. With some bites of sweet and spicy Edamame beans and tofu especially made kindly by the chef for us, our cocktails came in copper style mugs. I was hooked on Drunken Dragon’s Voli inspired Tai Basil Mule in particular. Made from Voli Black this cocktail is infused with basil leaf with a strong lime and ginger beer infusion. Very quenching and I would strongly recommend this Voli cocktail to be sampled. You WILL be delighted! This exotic-themed drinking and dining restaurant with it’s talented, friendly and helpful mixologists at the bar could pretty much create a bespoke cocktail with a Voli Black – Just talk to the friendly bar staff on the kind of ‘taste’ you would like and let them work their magic for you. Next up is the Fox Hole bar which is conveniently located just behind the Drunken Dragon with a little unmarked entrance behind the restaurant in an alley which makes the whole experience of Drunken Dragon and Fox Hole together fun and a little mysterious itself. If you’re planning a night out, it’s a great idea to package these two up together on the ‘Voli Bar Crawl.' 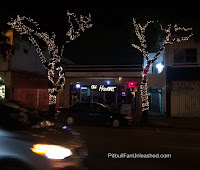 Pitbull loves his sport and this cool bar is very sports orientated with TV screens all over showing Live games, arcade areas with games machines. The place soon converts into a bar/club later on in the evenings. Visiting on a Monday, this place was already getting packed out in the early evening. Nice to watch some Live sports, listen to the banter between viewers and supporting sports teams in hand with a Volito – with that added splash of water of course! Enter the Edition Hotel. Elegant, sophisticated and demure. As we make our way through to the bar located in the basement which for obvious reasons is also named as The Basement Bar, we are catapulted into another universe! 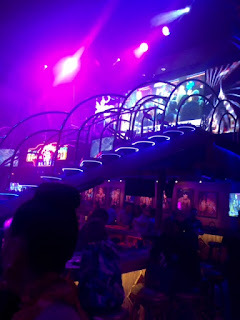 Fun, edgy, a constant stream of fast and vibrant neon style colour changing effects with a Live DJ pumping out the tunes. Entertainers skating around dressed in tu-tu's to wigs and more. This bar come nightclub is something quite unique, quirky, surreal and freakish - and it's only a Monday night! As you look around in delight and amazement while enjoying a Voli mix directly opposite and virtually attached to the bar we have a bowling alley and to the left an ice skating rink lit up bright like it's Christmas every day. 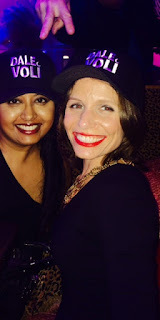 Turning up the fun factor, the Voli Girl and I managed to get the amazing DJ of the night to play Pitbull's FREE.K for us and match the vibe. Pump up the Voli with a disco vibe, Basement let’s you come as you are and simply have FUN while you're enjoying the smooth vodka however you want it. Get fun, creative, freaky with your Voli mix. This and more is exactly what The Basement Bar allows you to do and be! This beautiful lounge and bar is situated in the heart if Calle Ocho. Lit up fairy-light esque style from the outside. This chilled bar has comedy and open mic sessions on a Tuesday. Atmosphere on the night was very chilled and enjoyable and it's easy to get lost, sink back and relax in the ambiance and enjoy the jazz, blues and Live world music it’s fun and friendly Live band has to offer. But not relaxed to the extent you'll just want to chill. Believe me, you'll be tapping away your toes, feeling the rhythm and want to get up and dance to the music. Beautiful Cuban art on the walls and Voli decor all over the bar. From Voli black bottles lined up on the shelves to the rubber bar mat's lining bar top to bar end. Voli napkin and straw holders, cocktail mixers to a huge lime/lemon holder case. But the best for customers is a portable Voli phone charger - enjoy the Voli, atmosphere while your phone charges! 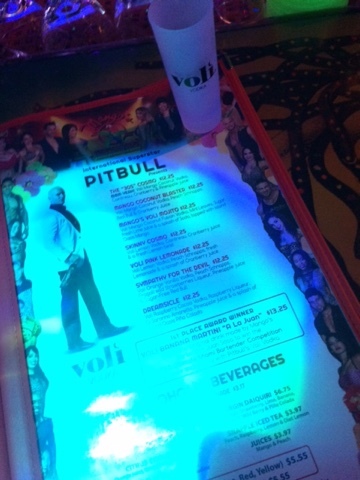 This bar is Voli-fied to the max. My favourite tipple at Club Havana is a mojito made with Voli Black. Intense, refreshing and exhilarating from the very first sip! A MUST visit and drink! 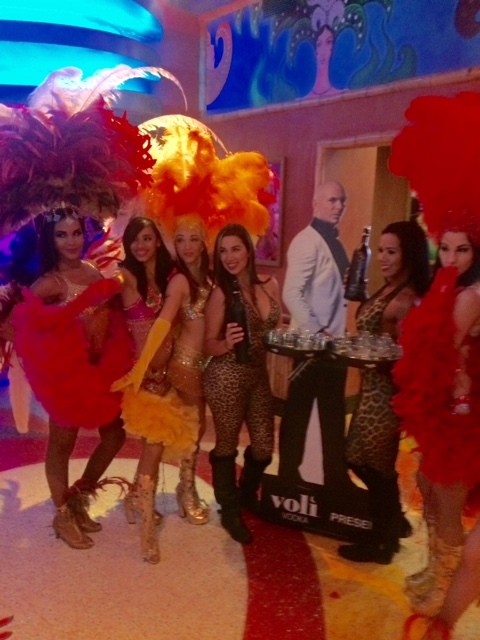 Thank you again to the wonderful Voli Girl and all of Team Voli for taking me off the grid, opening my eyes and palate to another side of Miami and experience other ways to enjoy Voli Vodka. 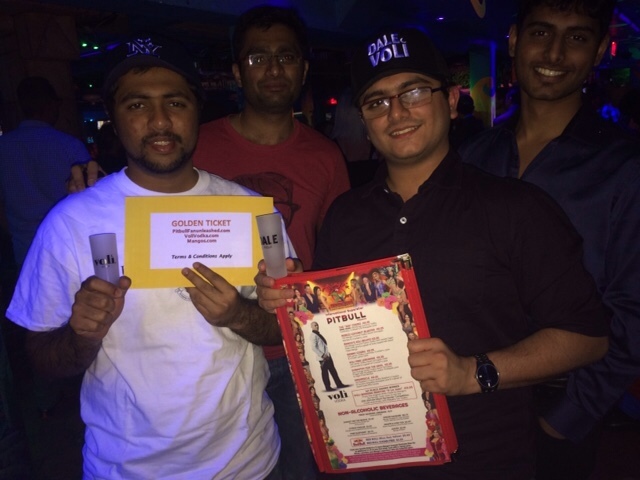 I strongly recommend Voli fans worldwide to have the above venues on their hit list to visit on their next Voli Crawl when in Miami and indulge in these variety of 'Voli Hot Spots' and appreciate the different vibes but same great vodka each one has to offer. Enjoy! Don't forget to check out the links below for more inspiration until you get to Miami! I went, I saw, I fell in love with Mango's Orlando even more. The Grand Opening in Orlando was a spectacular event. Greeted by an avenue of gorgeous Mango's dancing showgirls with headpieces and feather boas either side welcoming us into the venue dancing away to hot Latin music getting visitors warmed up and energetic before they've reached the grand area inside. Followed instantly by a beautiful Mango's lady with a tray of vodka shots filled with Pitbull's very own brand, Voli Vodka. A special line and creation of a unique signature, and appropriately named simply as 'Mango's Voli Vodka' with a blend of coconut and of course, mango! 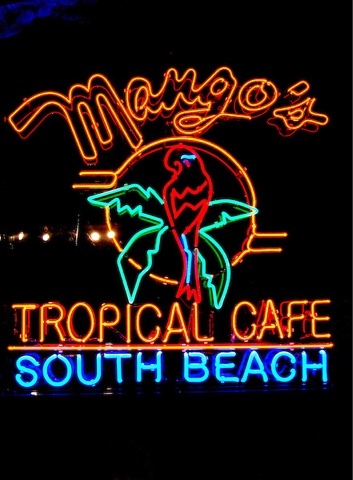 In line with the original Mango's South Beach 25th anniversary. 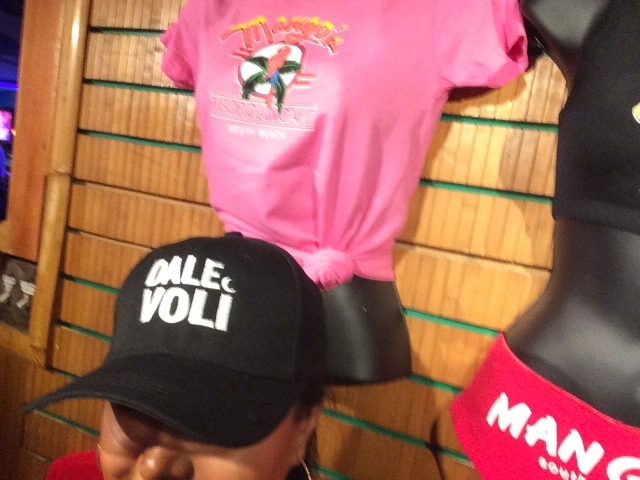 There was a clear and strong presence of Voli from the start who along with Pitbull have strong ties with Mango's Tropical Cafe. 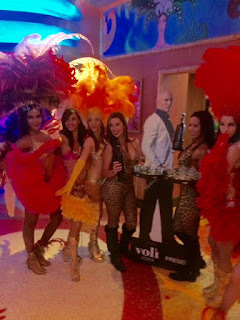 From backdrops, the striking Mango's Voli Vodka bottles, shot glasses, the new elegant, suave and smoothly polished Voli commercial/promo video featuring Pitbull on screens nearby to a current Voli promotional stand up life size cut-out of Mr Worldwide himself on display. The Voli charisma continued inside with the commercial/promo video shown on screens throughout the venue and merchandise from Dale Voli hats, unique shot glasses on table through to the menu which featured the very 'moreish', sweet and sophisticated winning cocktail of the 2015 Ultimate Miami Bartender Competition - The Voli Banana Martini "A La Juan" concocted by Mango's bartender Juan Sosa. It was a delight to watch the extremely talented and gorgeous salsa dancers give a dazzling performance to a catchy and uplifting theme tune which does and is very welcome to linger around in the head long after the performance and day is over "Come Fall In Love, Come Fall In Love, Come Fall In Loooove ..With Mango's" a perfect fit with Mango's signature slogan "Come Fall In Love"
The grand central area features a platform for a Live band with the majestic staircases either side of the performance area. Mango's is always a guaranteed place for a captivating experience. A night full of high energy performances back to back with continuous salsa performers, gorgeous guys wearing six-packs to the show stopping and breathtaking performances of the Michael Jackson impersonator who not only looked but also danced liked the late King of Pop to the point. Thrilling the crowd and driving it wild with his moves, smoke and other special effects taking the energy in the place to the next level. The treats didn't stop there. A special Live performance by Pitbull percussionist and sensational artist Papayo who performed 'Echa Pa'lla - Manos Pa'arriba' for which Papayo and Pitbull walked away with a Latin Grammy award for their collaboration under the Best Urban Performance categoty at the 14th Latin Grammy Awards. A song which also involved songwriter, producer and Pitbull's DJ from back in the day, DJ Buddha. 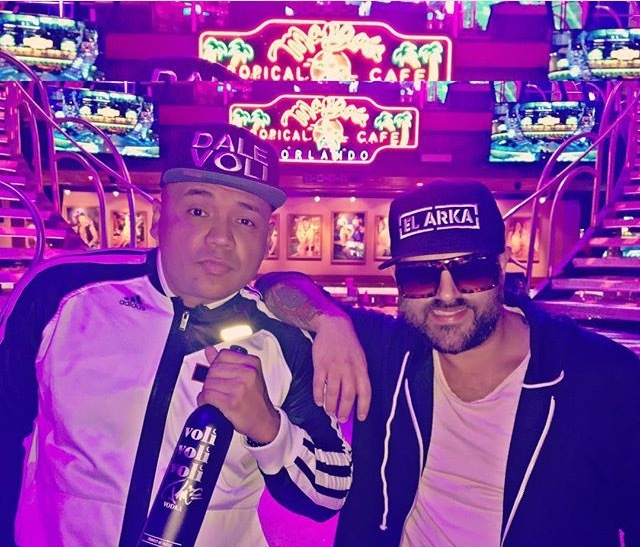 Papayo wowed the crowd with more of his hits such as Si Te Agarro featuring Pitbull's official DJ Chino and Fito Blanko of Mr Worldwide's very own label Mr 305 Inc of which Papayo is also under. Papayo also sang his own unique Latin spin on Cheerleader. Papayo was accompanied by Miami's hottest Latin DJ, Voli Vodka Ambassador who can also be heard on Pitbull's Globalization station on SiriusXM, the extremely talented DJ Africa on the decks. The Mango's Orlando interior is just as breathtaking as it's illuminating exterior. Already one of America's largest clubs in the country at 55,000 square feet. The venue is HUGE along with its central staircase and performance area also includes an upstairs for dining, drinking whichever takes your fancy. A balcony over looking International Drive and Vodou Lounge to dance along or chill to hip hop, reggaeton and more. Bar tops detailed with unique and vibrant mosaic designs to aquatic motion fish images through submarine style window screens behind bar areas to enchant even more. Canapés and buffets to sample the exotic cuisine to freshly rolled cigars courtesy of the Sosa Family Cigar Company which were also available and in high demand at the grand opening night. It was a pleasure and honour to meet Joshua Wallack (Chief Operating Officer) and David Wallack (owner) and watch a heartwarming father and son speech along with plentiful of other industry speeches made. Thank you Joshua and David for taking the time to chat and congratulations on such a wonderful concept and place. A very special thank you also to the Voli Vodka team without whom I would not be able to be there to see this wonderful event. A huge thank you to the Mango's team in Orlando and South Beach for having me, truly an honour to be at such an incredible place, event and personal favourite organisation and all that it represents. There's something for everyone at Mango's Tropical Cafe. It's been a joy to watch the development and construction of this beautiful giant through the eyes of social media and how magnificent Mango's Orlando has grown. The non stop captivating performances left me in awe. 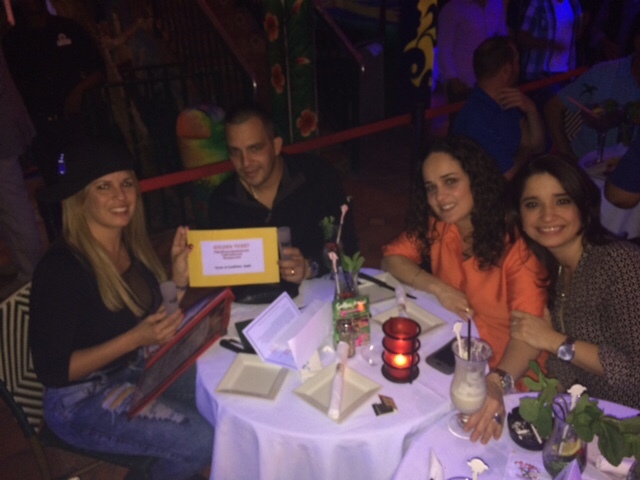 This along with the cuisine, drinks, friendly staff, dancers and overall team with the ambiance, decor, and tropical Latin paradise feel is simply genius and an absolute MUST to experience and allow oneself to be caught in Mango's magnetic charm and infectious energy. Check out more of the pics and videos below from the event below. Mango's Ladies are on Fire! 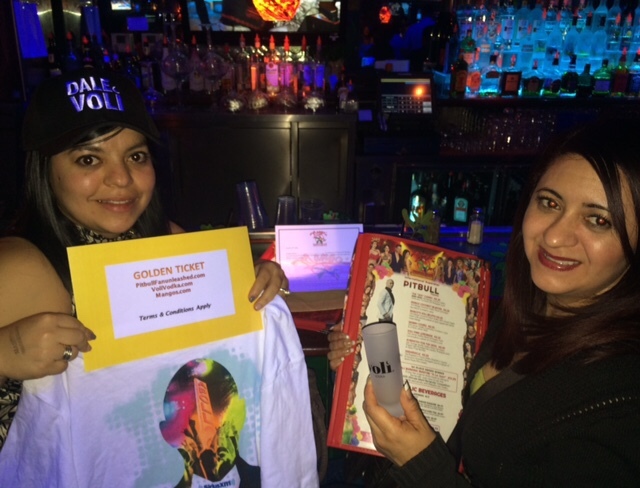 Pitbull Fan Unleashed along with Voli Vodka and Mango's South Beach held a Golden Ticket event on Wednesday 13th January to start the party just that little bit earlier for the Lil'Chico who turns 35 years young on the 15th January. 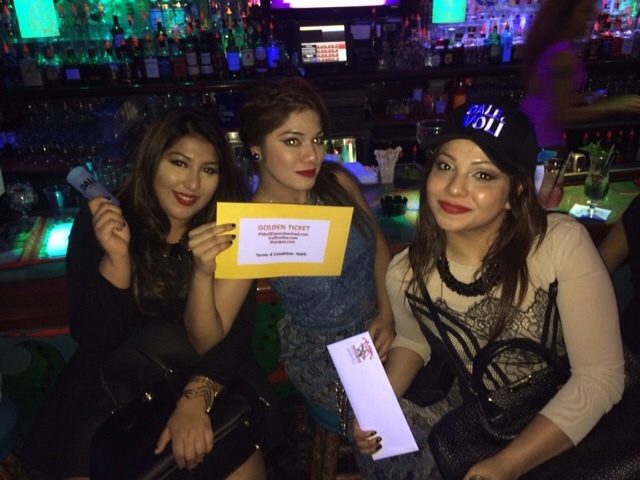 Between the hours of 8:30-11pm at Mango's South Beach, patrons had the opportunity to get their hands on one of six Golden Tickets at random. 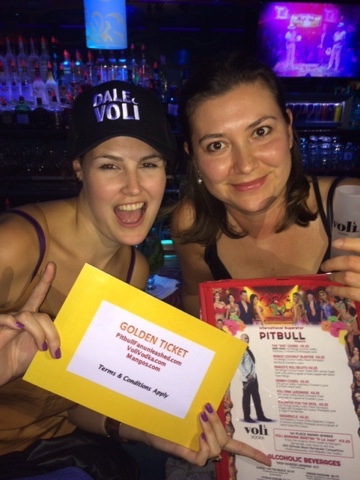 Only requirement for entry was to name/sing a song belonging to Mr Worldwide for me who would be handing out these tickets to lucky winners along with exclusive shot glasses and hats courtesy of Pitbull's very own brand of vodka, Voli Vodka. 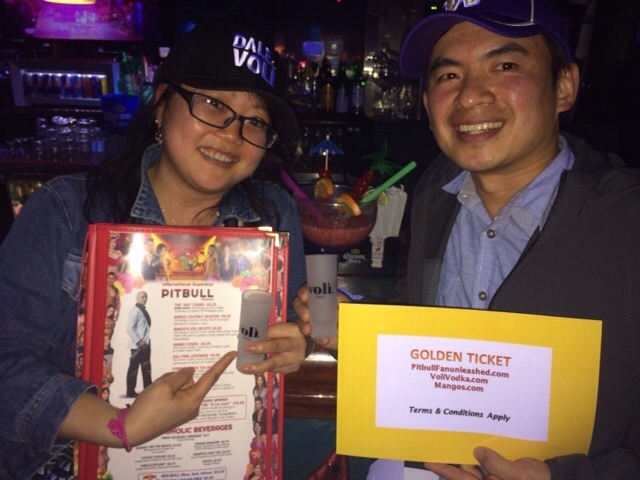 To make it easier, clues on how to find Pitbull Fan Unleashed wearing the Voli Vodka cap to be in with a chance were posted on social media. 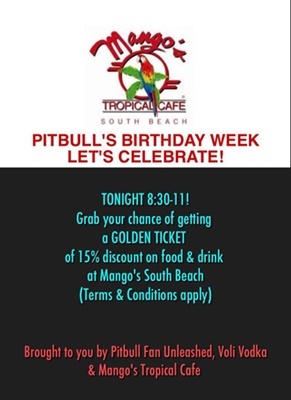 The Golden Ticket entitles the lucky person/group VIP admission to South Beach's most vibrant venue oozing Latin rhythms, flavour, energetic Live entertainment and delicious dishes with a 15% discount off the food and drinks and of course include a purchase of Voli Vodka along with other terms and conditions applied. Mr Worldwide is all about having F.U.N and just like 'Timber' that's exactly what went down. 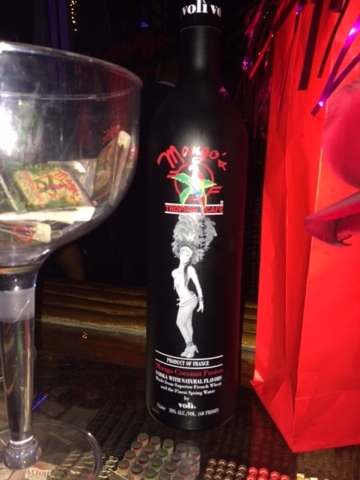 Thank you to all those who participated, as well as Mango's Tropical Cafe South Beach and Voli Vodka for making this celebratory event happen. See below for images for the fun evening.